Wider than Victoria, taller than Niagara. All photos courtesy of Joyelle West. Boston-based photographer Joyelle West is obsessed with the outdoors. 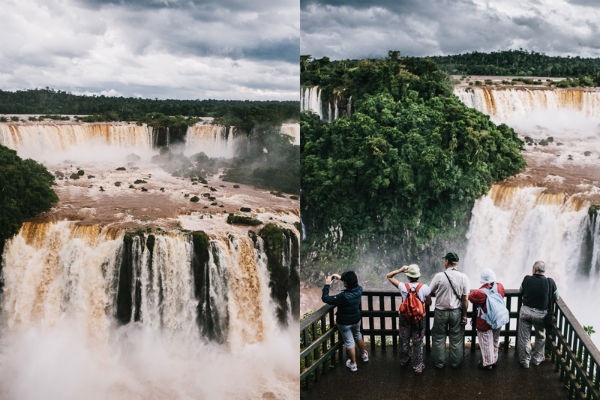 All it took was a quick read about Iguazú Falls to get her and her adventurous husband down to South America for a visit. An inspirational reader story. 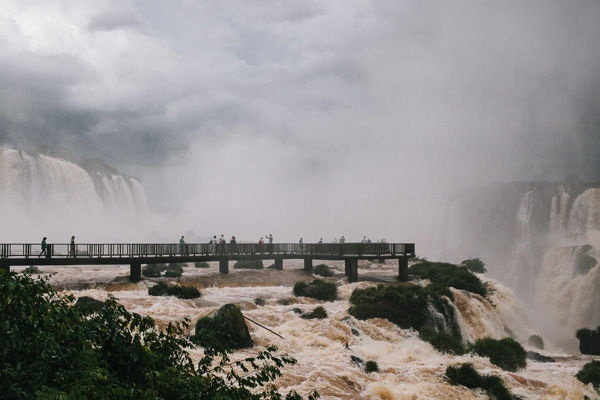 THE BORDER, Brazil and Argentina – Nature is impressive. Nature is beautiful. And sometimes, by way of its sheer size, complexity, or prowess, nature is humbling. I'm not talking about getting caught up in the flow of a stream or the ripples of a lake. I'm talking about standing in awe of a waterfall that physically divides nations. 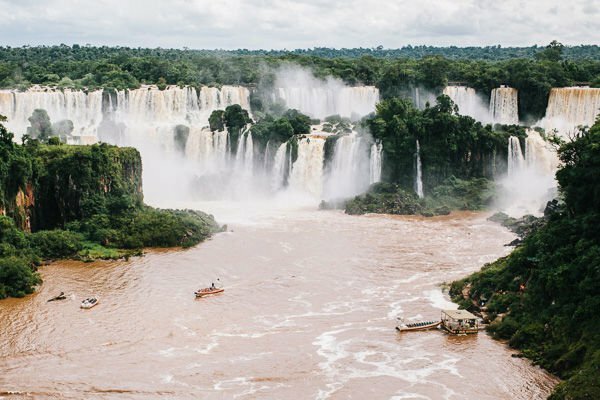 The site of Iguazú Falls lies on the border of Argentina and Brazil, and is considered one of the grandest stretches of waterfalls in the world. The Falls have been named a UNESCO World Heritage Site and one of the New Seven Wonders of Nature. Stretching for 1.67 miles amidst lush, tropical rainforest, it's something of a marvel. My husband Dan and I visited Iguazú Falls in March 2013. We were on the Brazilian side as a severe storm rolled in, covering the sky with Armageddon-style clouds. We managed to tour the falls and return to stable ground by the time it started to pour, but we weren't able to escape the storm entirely. The wind picked up and the skies fully clouded over. Rain began to fall, soaking everything, clothes and camera included. The downpour obscured my vision and made a very humbling experience even more surreal. You should see it for yourself. Standing in awe up close and at a distance. Puerto Iguazú is a two-hour flight from Buenos Aires. Schedule an early flight from Buenos Aires, since afternoon or evening storms can delay the schedule. The falls are half-an-hour away from Puerto Iguazú and are accessible by a taxi from the airport. Our driver took us to our hotel, waited as we dropped off our luggage, and drove us across the border to Brazil. They act like make-shift tour guides. They completely know the drill. I found out after the ride that taxi fare can be negotiated before the trip. But who would negotiate with someone who drops you off in another country and returns to get you six hours later? I wasn't brave enough to do that. 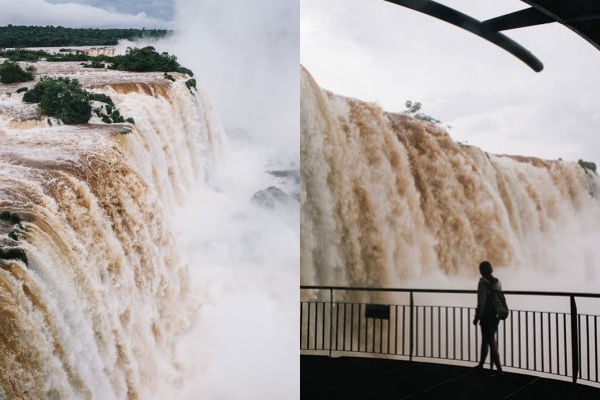 You need two nights in Puerto Iguazú to fully appreciate the falls. The park is divided into two sides: Argentinian and Brazilian. 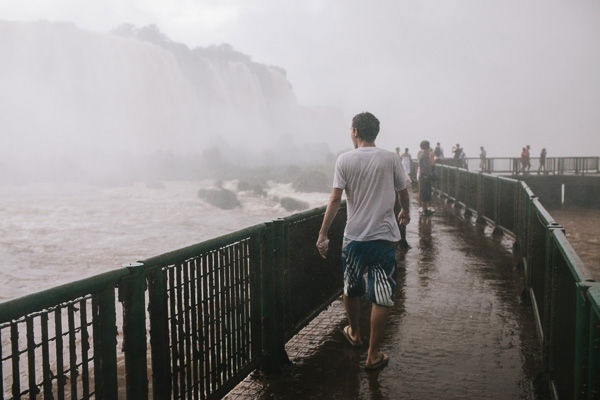 Most people visit the Brazilian side first to get an overall view of the length and beauty of the falls. We did that the day we arrived. 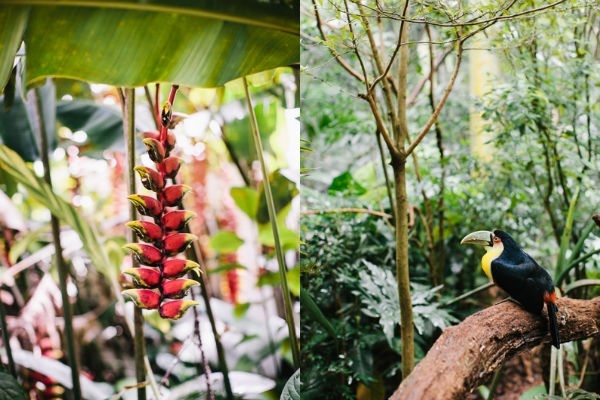 Falls zoomed out, tropical flora and fauna zoomed in. The taxi we hired at the airport took us to on the Brazilian side, where we got up close and personal with tropical birds. He then dropped us off at the park itself, , and came back to pick us up at a predetermined time. Sounds like a gamble, but these drivers don't actually get paid until the end of the trip (when they drop you off at your hotel at the end of the day). Make sure you bring your passport and Brazilian visa with you. Head to on the Argentinean side of the falls on day two. Here you'll be standing on catwalks above the waterfalls. For some, this is the real “wow” factor. You'll want the whole day to tour this giant amusement park made by nature. Plan to get wet! Wear a bathing suit as a base layer. If the weather is a little chilly (as it was for us on day one because of the approaching storm), bring a decent raincoat. If you don't have a waterproof camera, think ahead and bring a plastic bag for your regular camera. is a lifestyle photographer in Boston, Massachusetts. You can follow her at @joyellewest on . She travels for visual inspiration and because she can’t sit still.